Last edited by Miggy on June 22nd, 2011, 12:06 am, edited 1 time in total. York99 wrote: Very specifically, what will you do to ease traffic in Austin; what is your timeline for each step; why can I trust that you have what it takes to get it done; and will you commit to a public apology and resignation upon the failure of accomplishing those goals? Traffic and the tremendous number of homeless people have been basically my only issues with the city since moving to Austin. Remembering that the Mayor is just one vote amongst seven, I would still hope for a grander vision from our leaders - one that speaks to Austin's place amongst peer cities nationally and internationally, a vision that inspires its citizens to collaborate to overcome larger challenges and work independently to accomplish bigger achievements. That's me, though. To your issues, let me at least mention with what is in the works for each starting with the homeless situation. The State of Texas underfunds its social services and mental health facilities and while I don't know where Austin and Travis County stand relative to other cities/counties on funding, conventional wisdom tells us that it doesn't close the gap left by the State. So...what is being done about it? In March of last year City Council made a sea-change decision that went little noticed outside of the social service community. Namely, it was a directive to use affordable housing funding mechanisms to tackle 30%MFI (poverty level) housing instead of 80% (low-income working families, generally small infill projects in parts of town with good schools). Stick with me, here. MFI or Median family income in Austin is $73,800 so 30% or below is roughly $15,500 or below to qualify. What it means in practice is that the city will be following best practices nationally which stress 'housing first', providing shelter and then helping with addictions, employment, counseling, etc... It's also sometimes called 'wet housing' but in official documents you'll see it called 'PSH' or 'Permanent Supportive Housing'. It is believed that focusing on this need will begin to take people off the streets and into the care that they need or help them to support themselves. What has proven more difficult, not surprisingly, is finding parts of the city willing to accept low-income housing of this variety. It has not been easy, and won't ever be easy in the future - either because of vocal neighbor objections or other legal restrictions on public land (a large facility was planned for land the city owns by the airport, but it was purchased with Federal Aviation dollars that specifically prohibited new residential there). You get the idea. Anyway - support the affordable housing item the next time it comes up on a bond election. •	and finally some possible solutions, including some being discussed for Austin. First – you may have heard 'Austin has the worst traffic in the country' or some similar title. We did supposedly have the worst traffic of any mid-sized city in America, then we went over the hump in classification so we are now a large city and well back in the pack relative to other urban areas in that group. That aside, the metric is fairly flawed for a couple of reasons that under-report and some that overstate the root cause of people’s frustration. Congestion reports are calculated as a ratio of peak congested travel times by car against uncongested travel times by car. In other words, travel times are said to be "worse" only if they get much longer in peak commute hours than they are midday and then…only by car..not all commuters. What the implications are for Austin, a town where people still think nothing of living in Pflugerville or Cedar Park and driving to Oak Hill every day or vice versa, is that those long commutes mask, on paper, a commute time frustration that’s probably worse than reported by these metrics/rankings. But going back to the above issue of total time vs. relative time….I think (my opinion only) the issue that most people are upset about is the total time, not the differential between peak and off-peak hours. There may be some irrational consumer psychology at play but I think most people recognize that the majority of the time spent in their car concerns the distance traveled and not the delay (see pie charts above). To that extent, the solution is to live and work closer together – not always as easy as it sounds, I realize – but I know no shortage of people who buy houses in far off places like Buda and Kyle and then complain about the traffic at the I-35/71 interchange. I don’t want to say I’m deaf to those complaints, but I’m less sympathetic. Beyond this, there is perhaps a more theoretical debate that asks if congestion is a bad thing or if it is the natural state of a city. Less in dispute is that there is a genuine difference between congestion and mobility and that public transit, bike lanes, etc… seek to address the latter and get chastised for not solving the former. It’s unwise to promise a solution to congestion by funding transit but that’s what is done over and over again because it plays well as a message. When Cap Metro couldn’t get their 2000 light rail plan approved, they went for a cheap commuter rail plan (the current Red Line) and had a massive PR push that essentially boiled down to ‘support this to get other people off the road and your commute will be easier’. It’s wrong on a lot of levels, but that’s what people want to hear and even then many people wouldn’t vote for transit. What funding transit (especially dedicated rail) does do is it gives mobility options that can reduce the impact of congestion on your individual commute if you choose to use it, it gives opportunity to participate in economic life for those who cannot afford a car and it spurs efficient and dense nodes of development along fixed lines that otherwise might not occur. These are the reasons that the city of Austin is looking at building an urban rail. If you want to actually fix congestion of roads alone…you won’t like the answer…but the general response in traffic engineering practice is congestion pricing for use of those roads. I hear no shortage of vitriol regarding toll roads from even the most free-market of libertarians…so I’m thinking it’s a non-starter for most. Even Janette Sadik-Khan, Bloomberg’s transportation director in NYC, couldn’t get that through in Manhattan so I doubt you'll see anything like that here soon. Anyway...I hope this helps to share some of what's going on. Last edited by Miggy on June 21st, 2011, 1:59 pm, edited 8 times in total. Essentially, Michael McGill for Mayor! Miggy wrote: I would still hope for a grander vision from our leaders - one that speaks to Austin's place amongst peer cities nationally and internationally, a vision that inspires its citizens to collaborate to overcome larger challenges and work independently to accomplish bigger achievements. Indeed. I hear you. I love your passion and I'm looking forward to eventually voting for you. Here's where I wasn't complete. I think that if a mayor can effectively address a major concern of his or her citizens like traffic, then it means that A. This is a person who can probably get other things done, as well and B. This is a person who is looking out for the needs of its citizens first. I'm pretty ignorant of Austin local politics, but it seems to me that this grander vision might be what's hurting Austin right now. This massive influx of people is watering down the "weird" part of Austin, which is the biggest draw for a lot of people, not to mention the steep property tax hikes that hurt local businesses and bring in national chains and restaurants owned by huge, faceless restaurant groups PLUS all the additional traffic that is not being dealt with. I'm certainly not anti-growth, but it seems to me Austin's growth is not as responsible to its citizens as it could be. A grand vision is great, but not if it hurts the quality of life for the people who are living here. 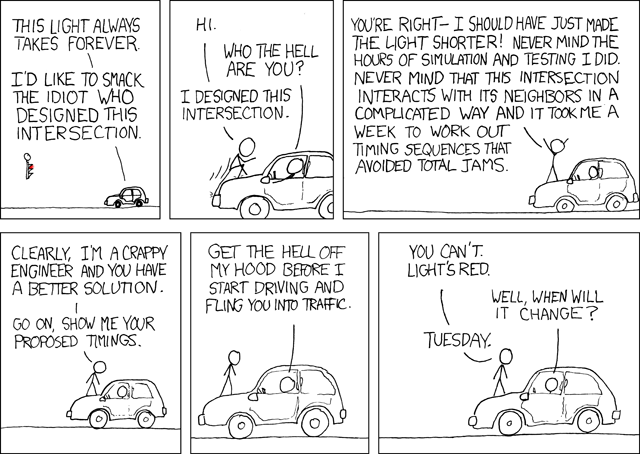 Also, whoever is in charge of timing traffic lights should be punched in the throat. Terry wrote: Essentially, Michael McGill for Mayor! Much more to the point. York99 wrote: Also, whoever is in charge of timing traffic lights should be punched in the throat. Luck has a way of rewarding those who do not depend on it. York99 wrote: This massive influx of people is watering down the "weird" part of Austin, which is the biggest draw for a lot of people, not to mention the steep property tax hikes that hurt local businesses and bring in national chains and restaurants owned by huge, faceless restaurant groups PLUS all the additional traffic that is not being dealt with. I'm with ya, brother. I don't think we do as good as we could at integrating newcomers into Austin and baking a bigger pie, so to speak. Certainly there is new energy being added every day and the University is a big part of that, but I think we fail miserably especially on the outskirts of town. It's a real opportunity if you add more people interested in patronizing local businesses, contributing to the local creative scene, innovating in the local tech industry, etc... Some of that is the tone set at the top. Last edited by Miggy on June 21st, 2011, 11:42 am, edited 1 time in total. Highly unlikely - but I'm very flattered. Just give it time. You'll come around. We're patient.